Worship of Family Deity helps you in your hardships! After ascertaining the Family Deity, one has to visit His/ Her temple, along with his family, and pray. One has to seek forgiveness from Family Deity for his ignorance all these days about this worship. He has to take a vow to worship continuously and visit the temple at frequent intervels. Family Deity only will help you in your hardships. Without pleasing the Family Deity, no other deities will come forward to help you. FAMILY Deity is the god worshipped by our ancesters and passed on to generations. When joint-families were in existance, in villages, the family members used to gather at their respective Family Deity temple, for praying and seeking permission to do auspiciuous functions in the family. Now the concept of joint-family is missing in large. Now nobody is interested to visit the native village and the family fuctions in the temples of Family Deity also have become rare. The modern generation people do not know who is their family Deity. Sri Adi Sankaracharya has grouped the worship of Gods into Six Groups known as Shanmatha Siddhantha. How to find your Family God? 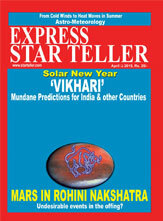 Approach your Family Astrologer, with your horoscope. The horoscope-reading would give you guidance to find out your Family Deity with 90% accuracy, with multiple choices of presiding deity and other associated gods, if any. 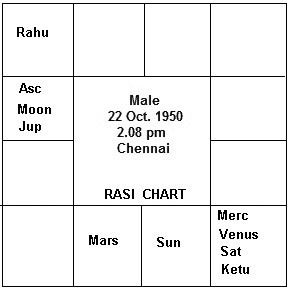 The Lagna, 5th place and 9th houses of horoscope can help you find out your Family Deity. The 9th place denotes your Father, 5th place your Grandfather and the Lagna denotes the native and his / her Great Grandfather. After ascertaining the Family Deity, one has to visit His/ Her temple, along with his family, and pray. One has to seek forgiveness from Family Deity for his ignorance all these days about this worship. He hasto take a vow to worship continuously and visit the temple at frequent intervels. Family Deity only will help you in your hardships. Without pleasing the Family Deity, no other deities will come forward to help you. 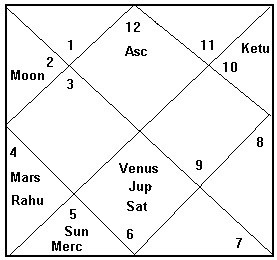 The 5th house is Gemini with no planets, aspected by Mars and Jupiter, along with Moon. Mars aspects the Ascendent, Jupiter and Moon. 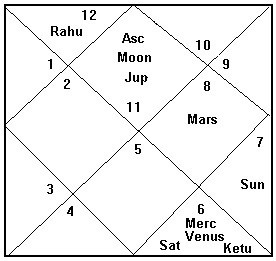 5th lord Mercury is with Venus, Saturn & Ketu, Except Rahu and Sun, all other planets are related to the 5th house in some way or other. Moon and Venus reflect women deities. Jupiter and Mars reflect male deities like Shiva, Karthikeya and a god with weapon. The place of Family Deity has to be on a plain surface, near the hills and a streem of water should also be flowing nearby. The native declared his Family Deity as Mahishasura Mardhini in Mathur village, near Tiruthani, Tamil Nadu. Presiding deity of Tiruthani Lord Karthikeya surrounded by deities Shiva and Vishnu. A branch of a river is flowing nearby Mathur. Readers are advised to make appropriate enquires, while responding to the advertisements in our magazine. Express Star Teller does not vouch for any claims made by the Advertisers. The Printer, Publisher, Editor and Owner of Express Star Teller shall not be held responsible / liable for any consequences, in case such claims are found to be false. The native is from Hyderabad (Telengana) He is a Srivaishnava. 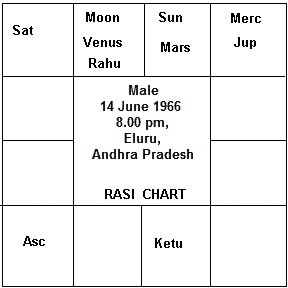 5th house is Aries, the house of Mars, with Moon, Venus, and Rahu, aspected by Ketu. Mars is with Sun in Taurus. 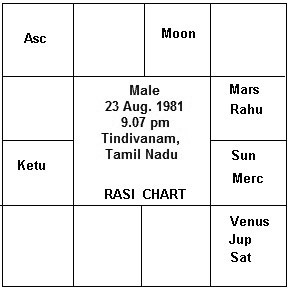 Venus and Mars are in Parivarthana (exchange of houses). Saturn from Pisces (Watery place) aspects Mars, the 5th lord. Aries denotes a hill place. Moon & Venus represent female deity, with Rahu & Ketu representing a Snake. Saturn from Watery sign denotes a perennial water-body nearby. Hence the Family Deity has been decoded as Lord Narasimha, with Goddess Lakshmi, under the hood of Adi Sesha (Nag). In the Family Deity temple, there has to be another shrine of Goddess Lakshmi separately; a flowing river is also indicated. The native then revealed about the temple of Panakala Lakshminarasimha Swamy, situated on a small hill in Mangalagiri, near Vijayawada, where River Krishna is flowing. The native is from Chennai. He belongs to Srivaishnava family. His parents approached me for knowing their Family Deity, very recently. 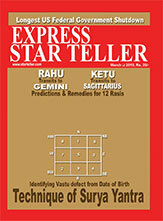 For Pisces Ascendant, 5th house is Cancer, a Watery sign, with Mars & Rahu. The 5th lord, Moon, is posited in its own star in Taurus. 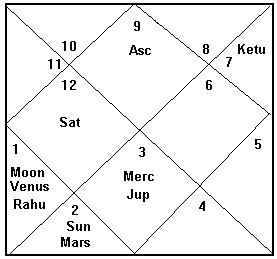 The 5th house is aspected by Ketu. Mars, for Srivaishnavas, denotes Lord Narasimha with Goddess Lakshmi, near a live river or a Tank or Sea, I have predicted Lord Lakshminarasimha, with Adi Sesha. Possibilities are there for temples for Lord Shiva, Shakti and the loacal deity of Lord Muneeswarar.